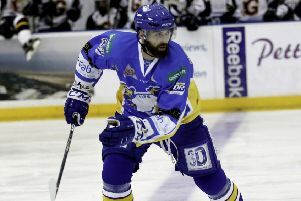 Fife Flyers’ match against Cardiff Devils, scheduled for tonight, has been postponed. The team has been delayed in Belfast as a result of ferry cancellations – and cannot make it back for the delayed face-off time of 7.30pm. Flyers were meant to sail after last night’s 2-1 defeat to Belfast Giants, but the ferry was cancelled, forcing an extra night in the city. They were scheduled to depart at 11.30am this morning, but that ferry has also cancelled. The team, and fans, won’t now sail until 3.30pm at the earliest, meaning the game couldn’t begin until around 9.00pm. The EIHL has announced it has now been postponed. In a statement it said: “Due to inclement weather in Belfast, Flyers were unable to take their scheduled transport back to Scotland last night. Flyers and Devils are working on a rescheduled date. Flyers have advised fans with tickets to retain them as they will be valid for the re-arranged game.